Here at Bancroft, our parent volunteers are critical to ensuring that our children are provided with programs and resources that greatly enhance their daily learning environment. 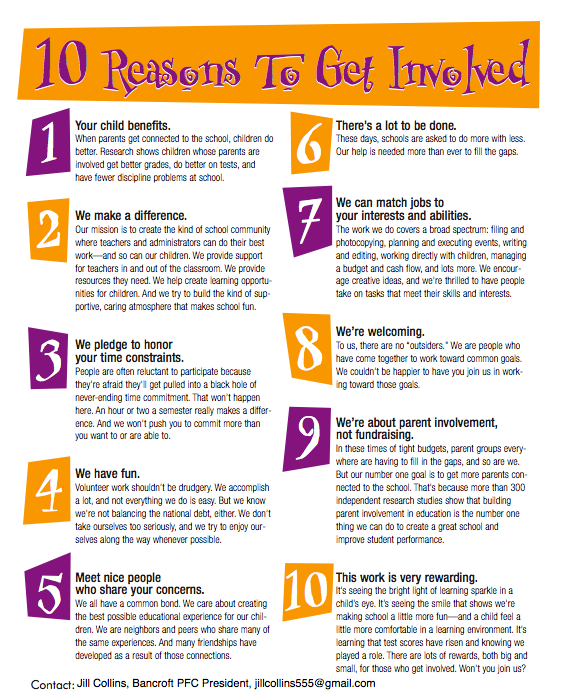 There are many different ways to get involved - for both working and non-working parents. We are always looking for those willing to give an hour, an afternoon, or a recurring time slot to the needs of the school and the students. Please consider how you may be able to help! The Mt. Diablo Unified School District requires that all volunteers have fingerprint clearance and evidence of freedom from active tuberculosis (TB) before volunteering in the classroom and on field trips. While there are volunteer opportunities outside of the classroom, the PFC highly encourages all parents and gaurdians to complete the MDUSD fingerprint & TB test clearance process to avoid any volunteering restrictions. 2. Register online for a fingerprinting appointment. Previous fingerprint records from other agencies are not acceptable. There is no cross-agency reciprocity when it comes to checking and monitoring fingerprinted individuals. The District office is open during the summer months and welcomes appointments. Waiting until the start of the school year can delay your clearance due to the overwhelming number of parents seeking fingerprinting appointments. At times, it can take anywhere from 2 weeks to 2 months to be fingerprinted at our District office. You must bring your TB test results and $32 in cash (exact change) or money order to your appointment - no personal checks or credit cards are accepted.